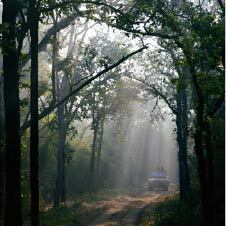 The Bandhavgarh National Park has a good network of jeepable tracks. 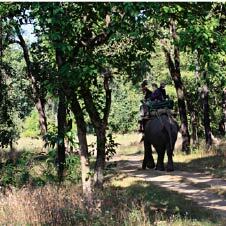 The park authorities allow two game drives everyday on these tracks. The morning drive starts at dawn and usually lasts for about 4 hours. The evening drive is shorter of about 3 hours. On prior intimation, exclusive drives and full day drives can also be arranged. All vehicles have to be out of the park boundaries before dark. The park is closed on Wednesday evenings. Only vehicles registered with the park authorities are allowed to go on park drives. 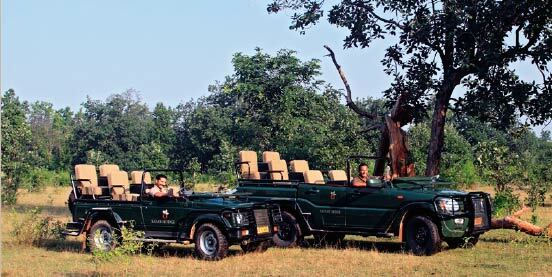 At Samode Safari Lodge we take you on the game drive in our own fleet of customized 4*4 vehicles. Designed for maximum viewing pleasure and comfort, these are also very capable offroad vehicles. 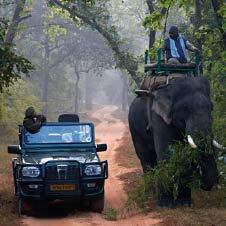 They are driven by our professionally trained guides. Each vehicle seats 4 or 6 people. 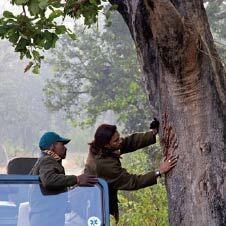 In addition to a local tracker and a professional guide from the lodge. 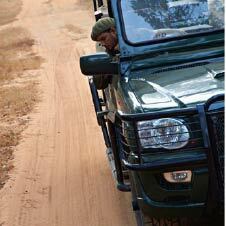 A local tracker and a professional guide from our lodge accompany you on all your game drives. They interpret the sights and sounds of the jungle for you. For an experienced and trained guide the jungle is like an open book, and he can make the jungle come alive by reading tell tale signs and listening to the sounds. Most animals, especially tigers, are creatures of habit. They have a regular patrolling pattern and they are partial to their favorite haunts. Our guides and trackers visit the park every day and keep a track of these movements by checking the spoor of the tigers and listening to the alarm calls of animals. These alarm calls advertise the presence of a tiger. 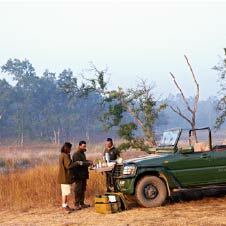 A good guide who is familiar with the animals of his area can substantially increase your chances of seeing a tiger. From the moment Yadu's piercing eyes lock onto yours, you are completely swept away and enthralled by his extensive knowledge of the natural world. 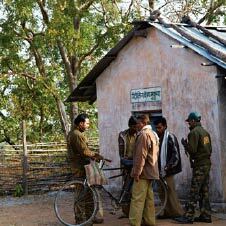 As one of the camps first employees, he helped in setting up the lodge. Once the doors of the camp were open to guests, he became a game tracker, helping to design an innovative set of game drives and bird/nature walks. Yadu is ever-ready to share his knowledge. Oblivious to time, he does not succumb to stress or pressure and gives the guests what they have come on safari for - a genuine wildlife experience. He is the guide for the connoisseur who wants to see and learn as much as possible. 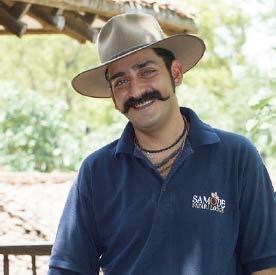 Anshu is the youngest guide at the Samode Safari Lodge. His youthful zest for life and vibrant energy are contagious and heart warming. Spurred on by his insatiable curiosity, this wonder boy of the new generation of safari guides seems to soak up knowledge like a thirsty sponge. His questioning and probing make for lively conversation around the campfire. 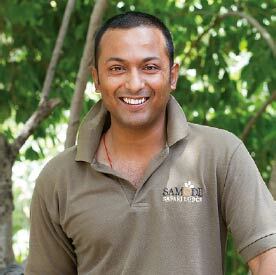 Anshuman was a part of the very first team assembled at the lodge site when the construction started in March 2008. 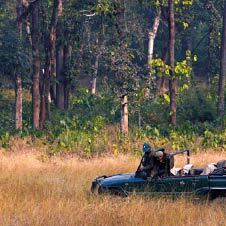 He is fast becoming one of the better known guides in Bandhavgarh, creating an exhilarating and thought provoking safari experience for people of all ages. He tries to plant a seed of inquisitiveness, to make his guests think about the natural world even when they get home. Copyright © 2015 Samode Safari Lodge -.Bandhavgarh India.